Of course you are familiar with the benefits of drainage on the land or in the greenhouse. Crops grow better and working conditions for preparing the seedbeds and for harvest are optimal. Homburg Tile Drain Cleaners are safe because they operate under a low water pressure of only 10 to 12 bar. The extremely sturdy HPE hose is pushed into the drain or tile (up to 500 metres (1640 ft)) making it possible for the specially developed nozzle to clean the drain and remove the dirt. Regular maintenance is essential for drainage to keep working in optimal field conditions. This is because your tile may become blocked with clay, sand, ingrown roots and iron oxide, resulting in a higher groundwater level and a greater risk of salination. This can cause the condition of your soil to deteriorate. Regular drain cleaning will keep your soil in top condition. And this in turn is reflected in the quality of your crops and greater yield. Homburg Tile Drain cleaners are economical to use, reliable and extremely robust. Their simple operation guarantees a safe and efficient working environment. In its design and construction of tile drain cleaners Homburg relies on many years of practical experience. 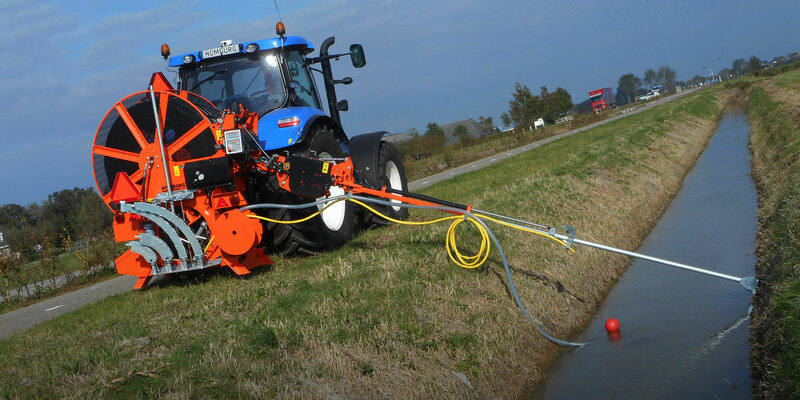 Homburg can offer an appropriate draincleaner for every specific situation. 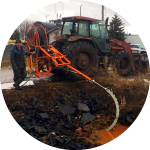 The patented system cleans without affecting the structure of the soil or the drain.